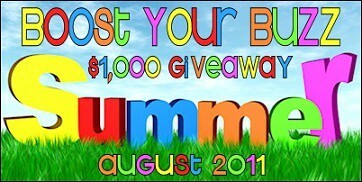 The time has come to announce who won the Boost Your Buzz $1000 Summer Giveaway! Out of over 208,000 entries, the lucky winner of the $1000 cash is…. Congrats to Jackie!!!!! You have to send us a pic of your facial expression when you found out you won!!!! Thanks to everyone who worked hard to put this together. This was my first time participating in such a contest (as a blog to follow and such) and I had a very good experience! Oh and I’ve been Thanking all morning!! But somehow Thanks just doesn’t seem good enough 😉 But I am truly THANKFUL to everyone who participated in this giveaway 🙂 Thank you so much! Congratulations Jackie! I am really happy for you – sounds like you could really use this fabulous prize.